Debutant Angelo Balanta scored deep into injury-time to give Bristol Rovers a late win over leaders Barnet. The substitute stooped to head the ball past new Barnet keeper Raphael Spiegel to put Rovers in the play-off zone. Matty Taylor had put the Pirates ahead early on after being set up by Andy Monkhouse, but Luisma Villa equalised with a deflected 30-yard free-kick. In between the goals, Barnet defender Sam Togwell dived to head Nathan Blissett's overhead kick off the line. Taylor fired just over the bar early in the second half before Barnet's top scorer John Akinde came close, but Balanta's dramatic intervention meant that Villa's 10th goal of the season was just a consolation. The result means that Barnet have now only won one of their last four games, but stretches Rovers' unbeaten league run to five matches. And it made it a disappointing debut for Spiegel, who joined Barnet on loan from West Ham earlier in the day. "The pleasing thing for me is that we're not getting carried away. "Barnet are a very good side with a very good manager so it's nice to get three points off them. "It's nice for Matty Taylor to get on the scoresheet again. "If we can get him a bit more confident in front of goal, he'll be a hell of a player for us." Match ends, Bristol Rovers 2, Barnet 1. Second Half ends, Bristol Rovers 2, Barnet 1. Goal! Bristol Rovers 2, Barnet 1. Lyle Della Verde (Bristol Rovers) left footed shot from a difficult angle and long range on the right to the bottom left corner. Attempt missed. Lee Mansell (Bristol Rovers) right footed shot from outside the box is too high. Assisted by Tom Lockyer with a cross. Foul by Bradley Goldberg (Bristol Rovers). Substitution, Barnet. Luke Gambin replaces Lee Cook. Attempt missed. John Akinde (Barnet) right footed shot from the centre of the box misses to the left. Foul by Charlie MacDonald (Barnet). Attempt missed. Angelo Balanta (Bristol Rovers) header from the centre of the box misses to the left. Assisted by Lee Brown with a cross. Substitution, Bristol Rovers. Ellis Harrison replaces Andy Monkhouse. Substitution, Bristol Rovers. Angelo Balanta replaces Nathan Blissett. Substitution, Barnet. Bernard Mensah replaces Luisma. Attempt missed. 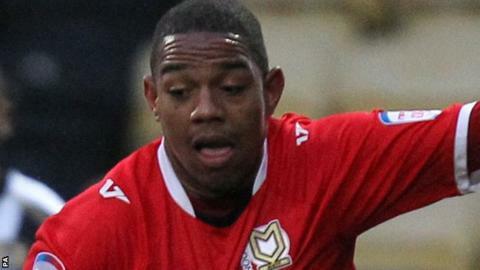 Nathan Blissett (Bristol Rovers) right footed shot from outside the box is too high. Attempt blocked. Curtis Weston (Barnet) right footed shot from outside the box is blocked. Assisted by Lee Cook. Charlie MacDonald (Barnet) wins a free kick. Attempt missed. Matty Taylor (Bristol Rovers) right footed shot from the centre of the box is too high.